After a little speech of a few words of some thanks and goshes, we were off, heading north toward Martha Lake, without Martha. It just didn't seem right but she had called and said she was running late and so I left a cue sheet for her on my car. The regular-sized-people on little bikes were out in front and, I tell you, I've never felt more out of place. I was on a huge bike and riding next to me was the Big Guy. Soon, we got into the rhythm of dropping people at corners (no, not to hitch a ride home, though there was some of that later) to direct the group. The Italian Job (Mario) and Steve volunteered frequently so that they could get their heartrates up by having to chase and re-join the group again after the sweep passed by. This ride had been developed with two types of people in mind: those who didn't shift through their gears and those who had sore backs; I knew we would be ok with a little climbing, especially after a caffeinated break. 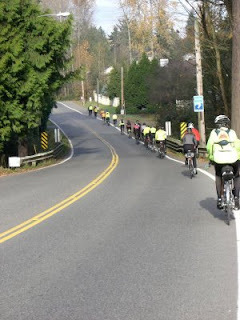 As we descended from Interurban Blvd to Broadway, we started to see the Laughers, my regular ride buddies, who were probably coming back from Snohomish with full bellies, uphill, breathing hard. 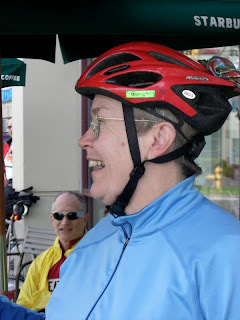 We turned south on Broadway and kept riding south, on (what I thought was) the often-travelled route until we suddenly reached the gas station at Woodinville-Duvall Rd. It turns out that the cue sheet says "R to Golf Course Rd" but it is not called that, it's really 240th St or some such ridiculously high number. The gas station was a better place to re-group anyway, but where is Bill and Adrienne? I just caught the last ring of my phone and saw it was Bill who had called. I left a message on his phone where we were going and we'd see him later. We zoomed down the hill, made the turn and cruised through downtown Woodinville, window shopping along the way. We lost Mark P to the trail, an automatic reaction, I guess, while we continued to Riverside Drive and back to Logboom on the trail. Thank-yous were said, nice to see you, great, yes, it was. See you next time. OK, everyone is gone, where is Bill and Adrienne? After some phone tag, it was discovered that they had been led astray and were between Woodinville and Redmond on Avondale and Adrienne had a flat and needed a pickup. Mark P and I, in separate cars (he's her close friend; I felt leader responsibility) zoomed over to her like the calvary and scooped her up. 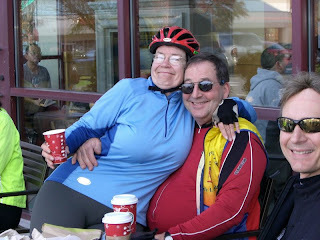 Actually, I scooped her and her bike, while Mark went to look for Bill. At least Adrienne had Bill's car keys but, after about 10 minutes back at Logboom, Bill showed up, then Mark after him. It was all just a good excuse to go out for dinner and "an adult beverage".